HF: Louis Ha and and the late Dan Waters kindly gave permission to post their article, HK lighthouses + men who manned them, on our website. This was originally published in the RASHKB Journal, Volume 41, 2001 linked below. The following is an extract from the article: Green Island Lighthouse started to operate on 1st July 1875, about three months after Cape D’Aguilar Lighthouse was set up. The illuminating apparatus was fixed dioptic of the fourth Order showing a red light on the bearings from N.16E. to S.18E (146 degrees). From N.16E. to N.44W. (60 degrees) and from S.18E. to S.25W. (43 degrees) it showed a green light. The focal plane of the light is 95 feet above mean sea level and in clear weather it should be seen at a distance of 14 miles. 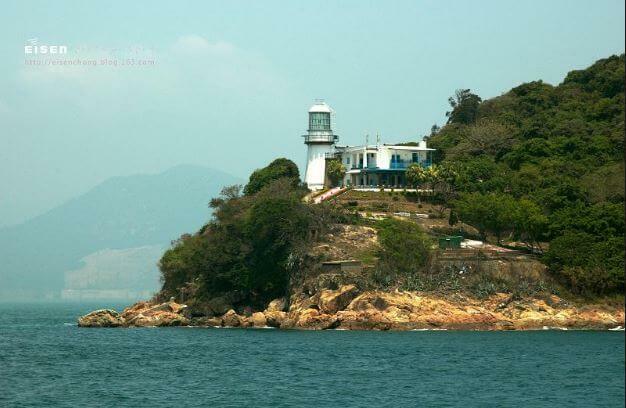 The small Green Island lighthouse tower is constructed of granite and is about 12 metres high. Its arched doorway is decorated with granite blocks with a cross-shaped opening above. In comparison to Cape D’Aguilar, Green Island Lighthouse cost much less, about one sixth of the cost for the Cape D’Aguilar lighthouse. When the Cape D’Aguilar Light became obsolete after the construction of Waglan Island Lighthouse in 1893 Governor Henry Blake later proposed to move the lantern of Cape D’Aguilar to Green Island. In 1905 a higher and larger tower to accommodate the Cape D’Aguilar Light was completed and the new lighthouse on Green Island came into operation the following year. It has a round tower, is 17.6 metres high and is constructed of granite and concrete with a spiral staircase. 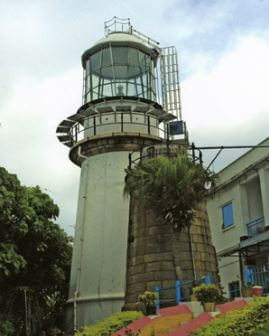 The steel lantern on top of the tower is painted white.